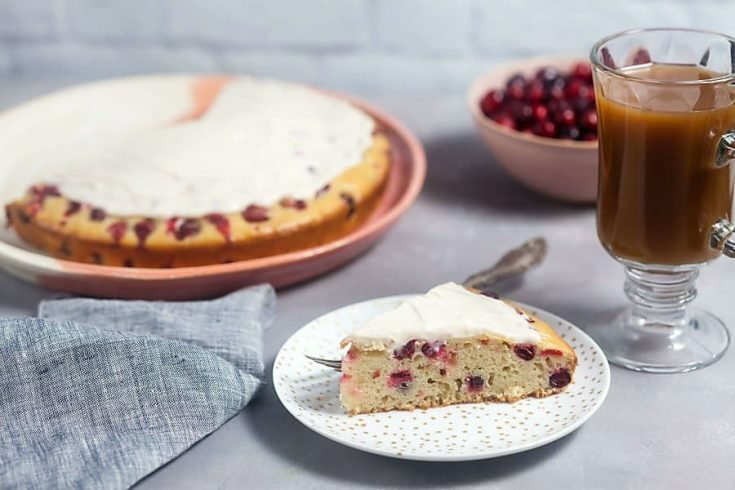 Cranberry Cake with Cream Cheese Glaze | Healthy. Delicious. 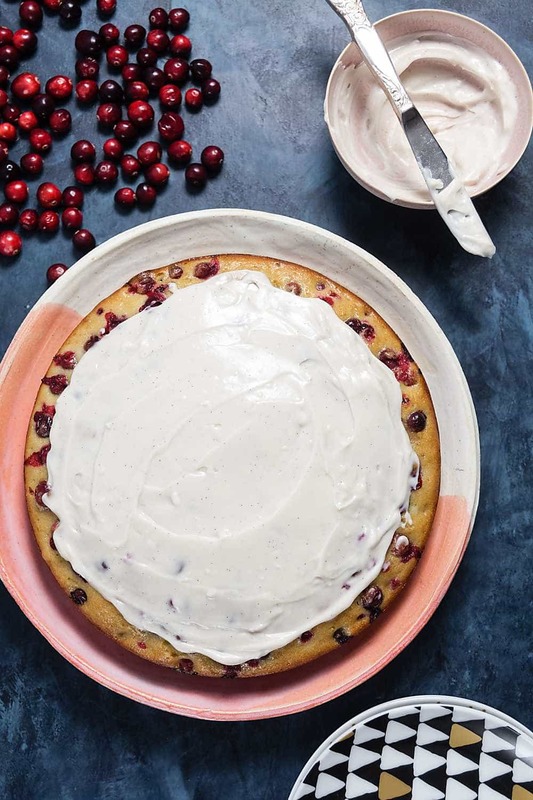 This sweet-tart cranberry cake topped with vanilla bean cream cheese glaze will be the star of your holiday season. Bonus – it’s dairy free! I created this recipe for my client, GO VEGGIE. As always, thank you for supporting the brands that keep me inspired in the kitchen. The end of daylight savings time has me dragging this week, but the arrival of fresh cranberries in the produce section of our corner market has kept a little pep in my step. 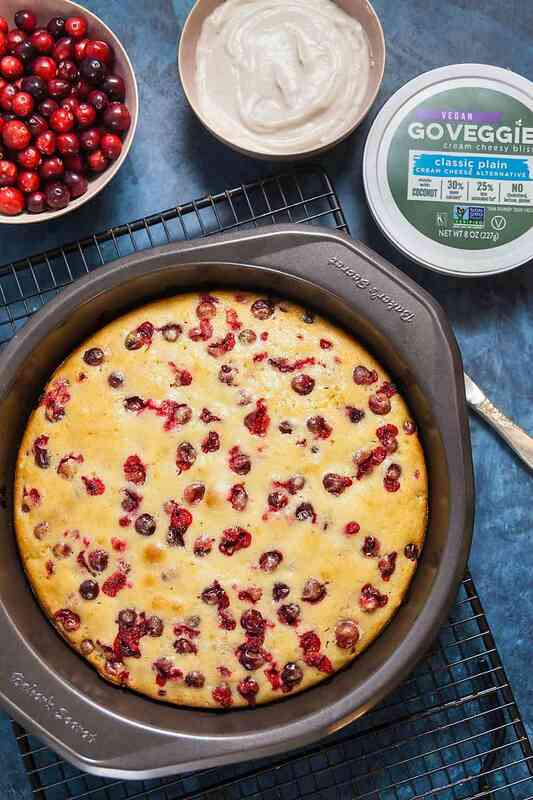 I love cranberries – I use them in sweet recipes like cranberry cheesecake parfaits and in savory ones like Coffee-Rubbed Steak with Cranberry Salsa. I even have an entire Pinterest board devoted to cranberry recipes. I bought three bags last weekend and prepared for cranberry nirvana. 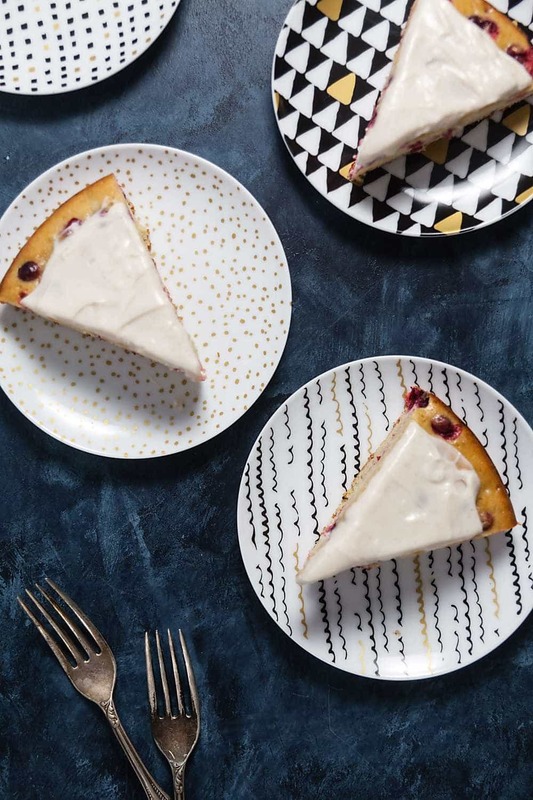 As it turns out, I ended up needing all three bags to perfect this dairy free cranberry cake. Sometimes my stubbornness is a good thing – when I set my sights on making this cake, I had no idea how difficult it would be to get just right. 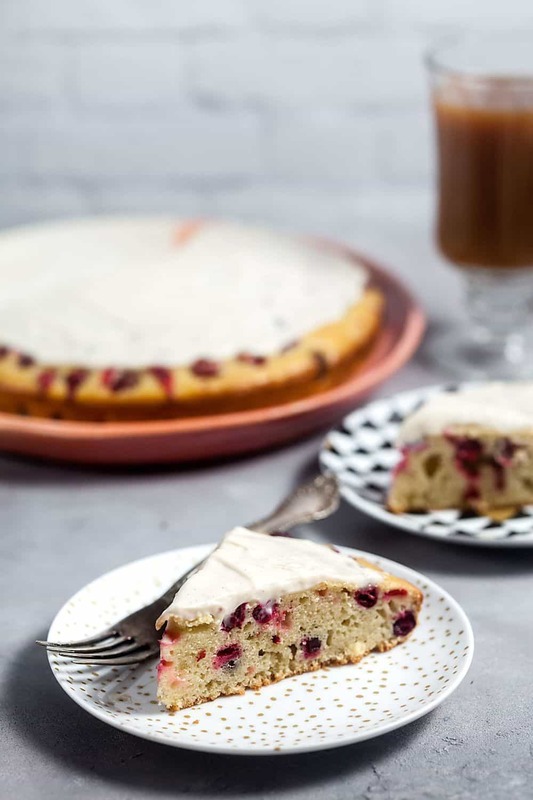 It took a few attempts, but I finally achieved what I set out to make: a sweet-tart cranberry cake blanketed with a layer of dairy-free vanilla bean cream cheese glaze. It’s the perfect sweet nibble to serve at the end of Thanksgiving dinner or at a holiday party this winter. If you’re feeling extra indulgent, it wouldn’t be entirely out of place at Christmas breakfast either. I won’t tell. Most fruit filled cakes like this one rely on a heavy, butter-laden batter to hold the everything in place. Obviously that wasn’t an option for this dairy-free version. After some experimenting, I discovered that my favorite replacement for was to use a combination of applesauce and GO VEGGIE vegan cream cheese. The applesauce keeps the dough moist and fluffy, while the cream cheese adds the density that I was looking for. 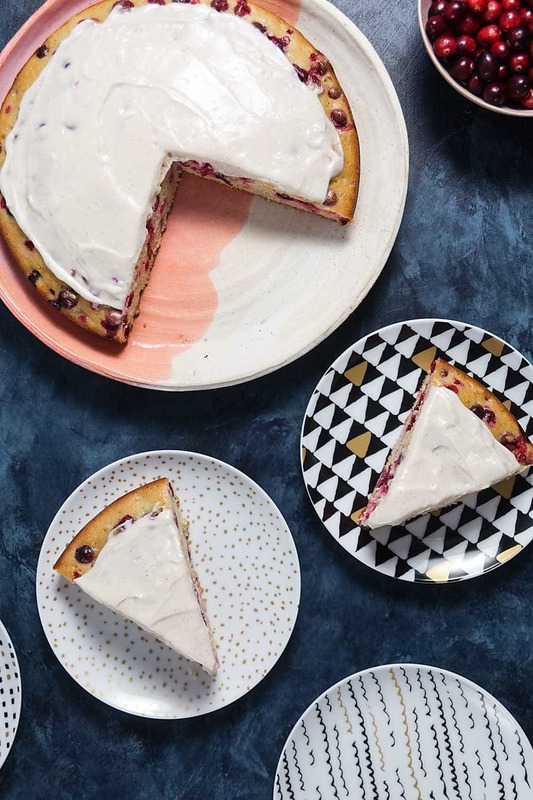 From there, I swapped in coconut milk for the dairy milk that my great-grandmother’s recipe I based this cranberry cake off of called for , and added a hefty glug of orange liqueur for good measure. The result is a moist, springy cake with a little bit of a pound cake vibe and the added benefit of being slightly lower in calories and saturated fat. 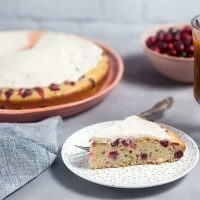 The cake itself isn’t super sweet, and the cranberries add pops of puckery tartness, so you’ll definitely want to add a frosting or glaze on top. I went with a super simple dairy free cream cheese glaze flavored with vanilla bean paste. Using cream cheese in the glaze pulls out the subtle cream cheese flavor in the batter, and I love the more complex flavor it has compared to a more traditional glaze that’s mostly just sweet. GO VEGGIE’s cream cheese is super smooth, which makes whipping this glaze up a snap! I kept mine pretty thick, adding just a few drops of coconut milk to make it spreadable. If you prefer a thinner glaze, you can add more coconut milk until it takes on the consistency that you ‘d like. In a small bowl, mix together 1 1/2 cups flour, the baking powder, and salt. In a large mixing bowl, use an electric mixer to beat together the applesauce, cream cheese, and butter until smooth and fluffy. Slowly beat in the eggs, one at a time. Stir in the orange liqueur. Slowly beat in half of the flour mixture, then the milk, then the remaining dry ingredients. Gently toss the cranberries in the remaining 1 tablespoon flour, then stir into the batter. Pour the batter into a 9-inch round cake pan. Bake 40-50 minutes, or until the top of the cake is golden brown and a toothpick inserted into the center comes out clean. Let the cake cool completely. To make the glaze, whisk together the cream cheese, powdered sugar, and vanilla extract until smooth. Add coconut milk until you achieve your desired consistency. Spread the glaze over the cooled cake.